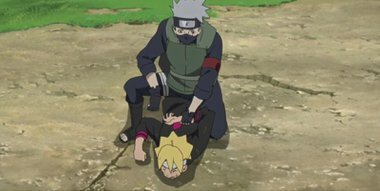 Boruto was the first to challenge the graduation exam’s proctor Kakashi, after being the first to arrive at his location, however, he is easily held down. Furthermore, Kakashi criticized not only Boruto himself, but also all his classmates, leading Boruto to become extremely frustrated. Boruto’s classmates arrive, and manage to free Boruto through a combined effort, allowing him to escape from Kakashi. Boruto is uncharacteristically depressed, so his classmates do their best to restore his spirits. Finding himself again, Boruto proposes a strategy to everyone.